In the past we have touched on topics such as the importance of reducing salt and increasing nutrient rich foods in your elderly loved ones diet. 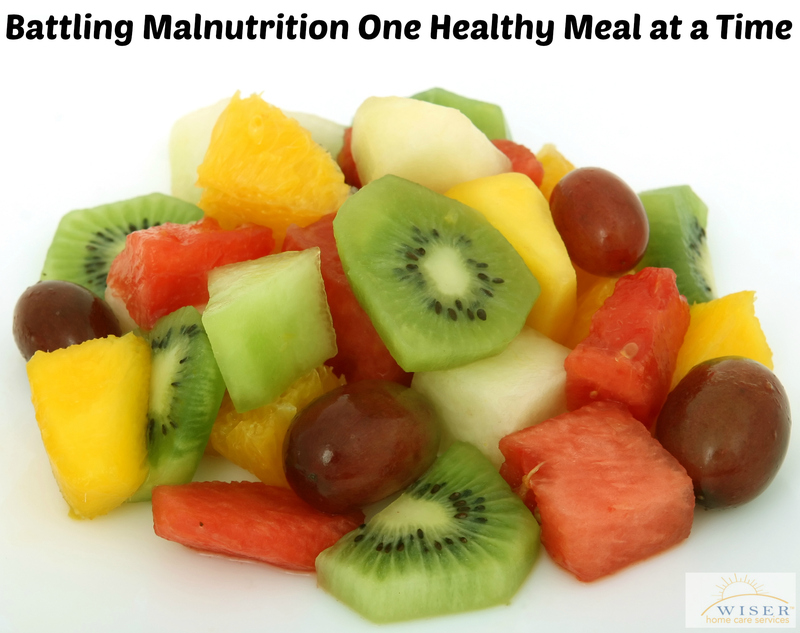 This week we plan to cover tips on how to reduce malnutrition amongst elderly adults. Malnutrition is a critical health issue among older adults caused by eating too little food, too few nutrients, and by digestive problems related to aging. Malnutrition causes fatigue, depression, a weak immune system, anemia, weakness, lung and heart problems, as well as skin concerns. Avoid skipping meals. This causes your metabolism to slow down, which leads to feeling sluggish and making poorer eating choices later in the day. Breakfast: Select high-fiber breads and cereals, colorful fruit, and protein to fill you with energy for the day. Try yogurt with muesli and berries, a veggie-packed omelet, peanut butter on whole grain toast with a citrus salad, or old-fashioned oatmeal made with dried cherries, walnuts and honey. Lunch: Keep your body fueled for the afternoon with a variety of grain breads, lean protein and fiber. Try a veggie quesadilla on a whole-wheat tortilla, veggie stew with whole-wheat noodles. Dinner: End the day on a wholesome note. Try warm salads of roasted veggies and a side of crusty brown bread and cheese, grilled salmon with spicy salsa, asparagus and shrimp. Opt for sweet potatoes instead of white and grilled meat instead of fried. Snack: It’s okay to snack. Choose healthy snacks from some of these high protein choices. Cottage cheese with fruit, almonds, hard boiled eggs, deli rollup – low sodium deli meat with 1 slice of low-fat cheese, nut butter boat – almond or peanut butter topped on celery or apple. Mini bean and cheese quesadilla – 1/2 c black beans, salsa and 1 slice cheese, protein shake, hummus – dip favorite veggies, banana nutter – rice cake, peanut butter, banana and cinnamon, grape and cheese cubes on a toothpick. Find out what your family/client likes and scour the Internet for lots of interesting recipes and ideas.